As reported in 1953, DNA double helix structure is oriented in opposite directions (the 5’ to 3’ and 3’ to 5’ directions). However in vitro, all reported DNA polymerases could only catalyze DNA synthesis in the 5’ to 3’ direction. No enzyme activities had been reported to catalyze DNA synthesis in the 3’ to 5’ direction. Molecular biologists could not explain this contradiction. In 1963, Reiji and Tsuneko Okazaki started their research to uncover this essential mystery of DNA replication. They hypothesized that lagging strands of DNA (in the 3’ to 5’ direction) are synthesized as short DNA fragments in the 5’ to 3’ direction and linked to form a longer DNA chain. Finally, Reiji Okazaki and his co-workers discovered short 1 to 2 kilobase DNA fragments as intermediates in growing long lagging DNA strands. When Reiji Okazaki reported this in vivo mechanism for DNA chain growth at the 1968 Cold Spring Harbor Symposium, Rollin D. Hotchkiss gave the name Okazaki fragments to the nascent short precursor DNA strands for full size genomic DNA. 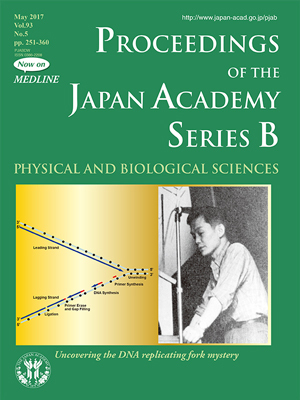 The cover photo is of Reiji Okazaki when he reported discontinuous replication at the Cold Spring Harbor Symposium in 1968. Unfortunately, Reiji Okazaki passed away in 1975, too early to know the thorough process. An important question still remained about the initiation of Okazaki fragments. No DNA polymerases can initiate DNA chains. Tsuneko Okazaki and her co-workers revealed that RNA priming is the initial step for the DNA fragments. Short primer RNAs are synthesized, and then DNA fragments elongate to 1 to 2 kilobase. Then primer RNAs are removed, and remaining gaps are filled with DNA and then ligated to form long lagging DNA strands. Multistep reactions for lagging strand synthesis were finally revealed by subsequent studies by Tsuneko Okazaki and her co-workers. The cover illustration shows the multiple processes of reactions of DNA chain elongation at the replicating fork. In pages 322-338 of this issue, Tsuneko Okazaki recalls the story of discovering Okazaki fragments and uncovering the multiple processes of lagging DNA strand synthesis. Discontinuous DNA replication mediated by Okazaki fragments is now known as the general process of DNA elongation not only in prokaryote but also in eukaryote, and described in almost every biology textbook.